Four new homeowners were handed the keys to their castles yesterday as a result of some long and hard work by the county Home Program. GrantWorks project representative Jay Francis was on hand along with builders Robby Brewer and Jim Chausse of Brewer Built Homes of San Angelo to reap the personal rewards of their work. County Judge Carlos Urias said, “It’s incredible to see the emotion of the results of these grant programs. A home is one of our biggest investments. 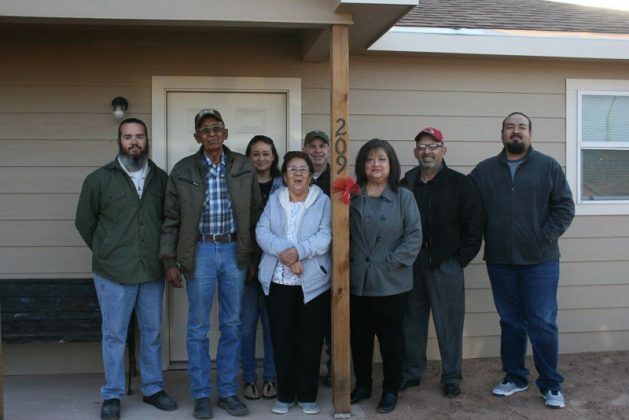 The new homes bring value and pride to county residents in Van Horn.” The Judge was joined by his wife Yolanda and assistant Adrian Hinojos for the momentous occasion and there was plenty of hugs and tears to be shared. Jesus and Maria Solis, Angelica Abreo, Linda Lopez, and Ismael Mendoza are the homeowners of the new construction that began in the Spring of 2017 with each home project taking about 3 months to complete. The homes are of substantial quality and are handicapped accessible in many ways including smoke detectors, three-foot-wide hallways, wide door, step-in showers, handicapped toilets, and lower positioned handles and knobs. The applicants were able to choose from three floor colors and any outside house color for the Hardi Siding used. There were 2 floor plans measuring 1104 square feet to accommodate narrow property lots. The houses are built to code and insured for $85,000. When asked how he felt receiving a new home, 81-year-old Ismael Mendoza said his house is very pretty and he couldn’t be happier. “I want my family to enjoy this house with me. I want to thank all who help with this and especially thank God for all he has given me”, said Mendoza. Judge Urias and County Commissioners have already begun the application process for new eligibility to continue to improve on housing and the lives of our residents. 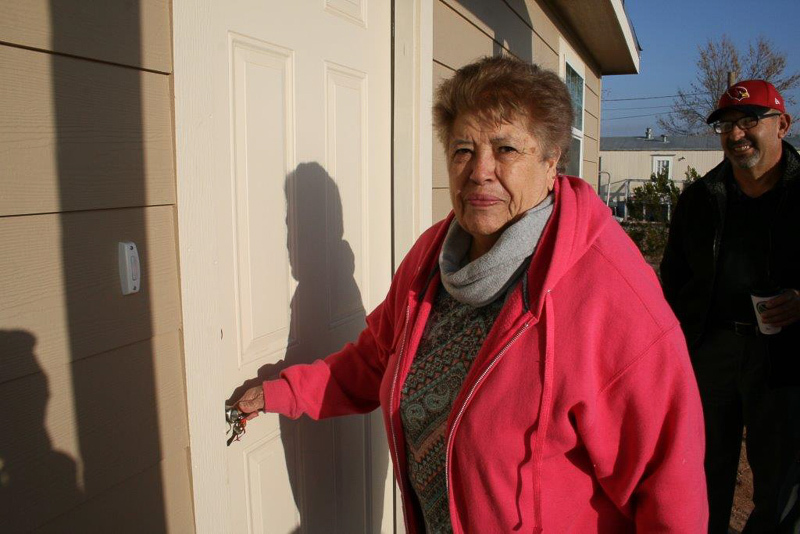 Angelica Abreo turns the key to enter her new home on Parker St. in Van Horn. 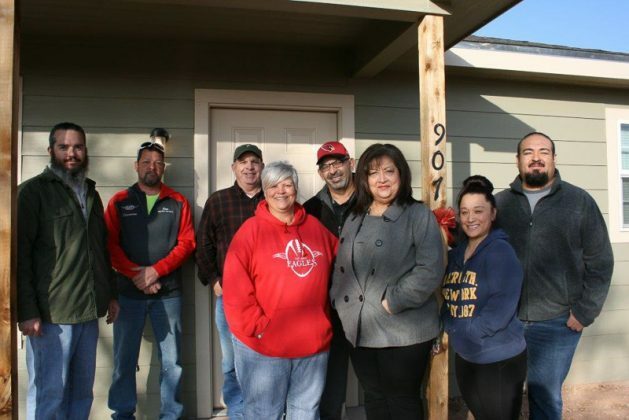 Pictured L to R: Robby Brewer, homeowner Jesus Solis, Marisol Brown, homeowner Maria Solis, Jay Francis, Yolanda Urias, Judge Carlos Urias, and Adrian Hinojos. 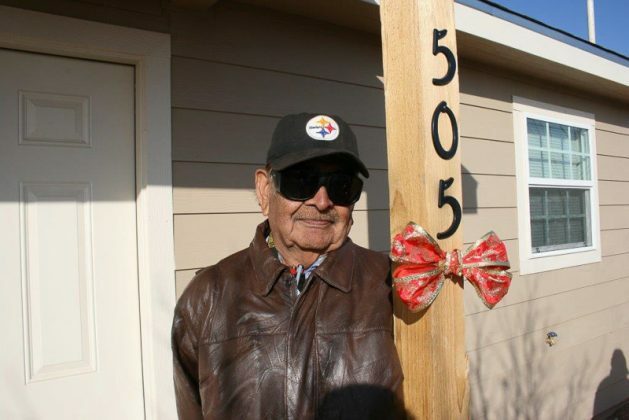 81 year-old Ismael Mendoza is the proud owner of his new house, built on Lamar street.